Space Aliens. When those two words are mentioned in Bismarck today, usually our first thought is great food and fun at the local bar and restaurant that was established by Mort Bank in 1997. As it turns out, Bismarck might have been the sight of “space aliens” nearly 57 years ago – the real thing, according to some enthusiasts. Bismarck’s famed, but often forgotten, UFO sighting occurred back in 1953, during the nights of August 5th and 6th. 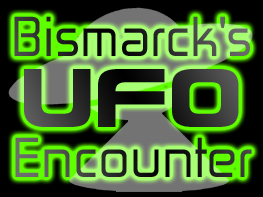 Unlike other cities with sightings, Bismarck has never embraced its alleged extraterrestrial encounter; however, the incident, known today as the Ellsworth Case, has come to be known as one of the most significant UFO sightings ever reported. The object, described as being a “red glowing light making long sweeping movements”, was witnessed by at least forty-five local people and detected on radar by the Air Defense System. Several officers with the Air Force were direct witnesses to the red glowing object hovering over the region. Prior to being spotted in Bismarck, similar glowing objects were reported throughout western North and South Dakotas. Two F-84 Thunderjets were dispatched by Ellsworth Air Force base in Blackhawk, South Dakota to investigate the phenomena. The jets engaged in a small chase of the object, with radar continuing to monitor both the jets and unidentified object throughout the chase. Shortly after the incident over western South Dakota, radar picked up the object hovering over Bismarck. The pilot of an Air Force Globemaster C-24, dispatched after the object was detected on local radar, was witness to the object hovering over the capital city at 1:09am on August 6. Whether it actually was an alien spacecraft, as some believe, or something else entirely, there is little doubt that an unidentified flying object was hovering over Bismarck and other parts of western North and South Dakotas on the nights of August 5th & 6th, 1953. To this date, no logical explanation has been given to explain what the object may have been. The Ellsworth Case, named after the Air Force base which first detected the UFO, is noted as being one of the most significant reported UFO sightings, due largely to the heavy documentation conducted by the Air Force during its investigation of the object.